East Coast Broadcasters: A Lifeline During Blizzard | Broadcast Public Service: Local Stations. Big Impact. On January 22-23, Winter Storm Jonas brought record snowfall to the East Coast, with parts of New York City, Philadelphia, Baltimore and Washington, D.C. receiving more than two feet of snow. Local radio and television broadcasters provided wall-to-wall coverage of the storm, delivering critical updates on weather patterns, road closures and emergency information to local residents. News crews and station staff members braved the elements during heavy snow falls and winds gusting at up to 40 miles per hour. They stayed at nearby hotels or set up cots at work to make sure their stations stayed on air. 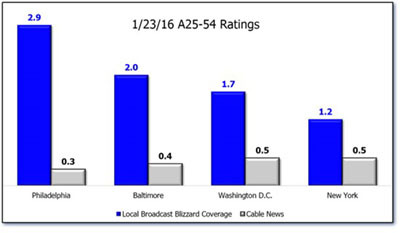 The Television Bureau of Advertising (TVB)’s analysis of Nielsen data "reveals that local broadcast TV news was overwhelmingly preferred as the source for storm coverage over cable news during the blizzard on January 23, 2016." TVNewsCheck shared a video from Sinclair’s ABC affiliate WJLA’s 56 hours of live coverage, captured by 24 crews. Hearst’s NBC affiliate WBAL viewers thanked the station for providing critical updates. One viewer said: "I just want to give you and your news casters a HUGE SHOUT OUT!!! We can always count on you to be out there in the thick of things whether winter conditions or other news worthy conditions keeping us up to date and informed. Especially now. My heart goes out for all you guys out in this nasty night letting us know what to expect. Everyone forgets that without the news we would be in trouble. SO A BIG THANK YOU TO EACH AND EVERYONE OF YOU!!"